Despite my lack of religiosity, I tend to be a somewhat superstitious person which I blame on my Mexican Catholic upbringing. For that reason things that shouldn’t bother or scare me, like ghost stories, the dark and forests, sometimes do. For instance, I recently purchased two mid-century nightstands from a thrift store here in Lincoln Heights. I kept these nightstands in my garage for a little while, then moved them into my house and when I went to clean them, I made an unfortunate discovery: an old doll. 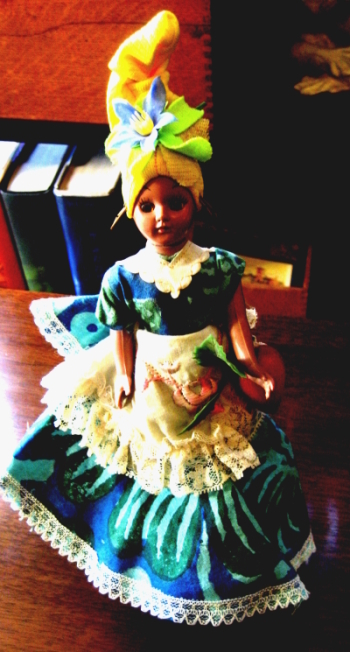 Not just any doll, a doll that looked like some kind of voodoo priestess (see photo above). Okay, so I know it’s unfair of me to call her “voodoo” when she’s wearing the traditional dress of the Caribbean but it’s not the kinda doll you want to find randomly in an old piece of furniture. When I first pulled it out of the drawer, my boyfriend said out loud what I had been reluctantly thinking: “oh, oh brujeria!” He said it as a joke of course, but it planted that tiny seed in my mind that grew into irrational thoughts. Why was the doll still in the drawer? Why didn’t the workers at the store discover it? The doll, which looks like it’s from the 1950s is remarkably preserved. Has it been stuck in the drawer all this time? Finally, a tiny bit of rational thought broke through my tense, muddled mind and I mustered the courage to pull the doll out of the drawer and stick it in my cabinet of knick-knacks. It’s something I should have done weeks ago but didn’t have the nerve. I hate being superstitious and silly but it’s one part of myself that will probably stick with me for a very long time…whether I like it or not. It is cute. If you hadn’t admitted to finding it in the drawer, it wouldn’t have seemed creepy. Cute’s in the eye of the beholder. My mom takes all of the creepy stuff she finds/gets/manages to discover to my three-year-old niece, who thinks they are fabulous and prominently displays them around my sister’s house in Utah. It’s the voodoo power of the doll that is lulling you into think it is cute.